Better late than never? Let’s see if the Terra can take on the best of them. 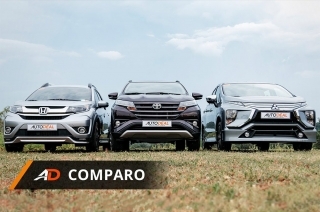 In the land of the MPV and AUV, the midsize SUV enjoys a solid market share and a healthy number of manufacturers field their own entrants, vying for the coveted crown. 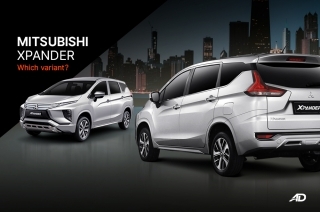 Known for their off-road prowess, seven-seater configurations, powerful yet typically frugal diesel engines, and a healthy dose of safety and technology rolled into a package that attracts your average vehicle buyer. 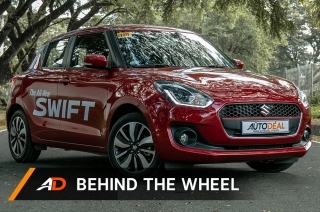 There’s no denying that this category of vehicles does it all, and that is why the midsize SUV will always be an aspirational purchase, always occupying a spot in the garage of many Filipino families. 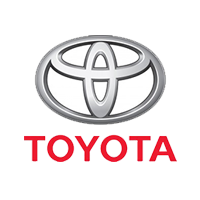 With Toyota, Chevrolet, Mitsubishi, Ford, and Isuzu having been in the game for quite some time, these brands have earned years of customer trust and product satisfaction, key elements in winning over new customers and retaining old buyers alike. 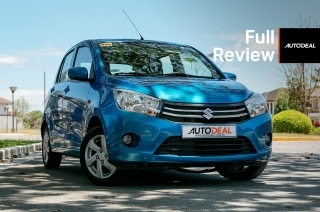 What’s better than purchasing a vehicle that offers everything a family needs, with good after sales and spare parts aplenty? 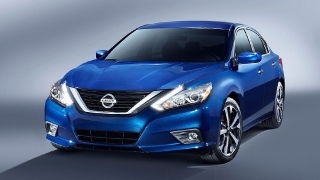 Nissan’s newest product enters at an interesting time, challenging the establishment, and applying their own personal take on the idea of the perfect midsize SUV. 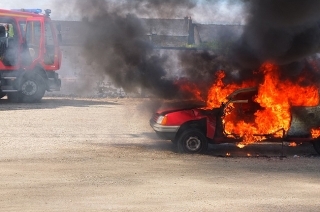 The 2018 Nissan Terra adds fuel to the midsize SUV bonfire, with customers sitting around, roasting their marshmallows, waiting for the perfect time to take a bite. 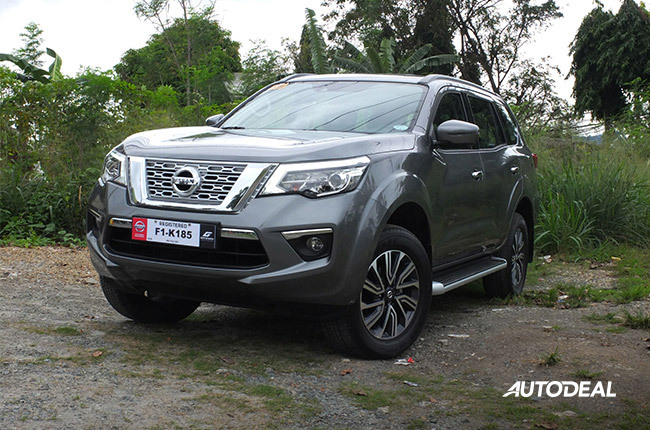 There’s no denying that the Nissan Terra is a handsome-looking midsize SUV. 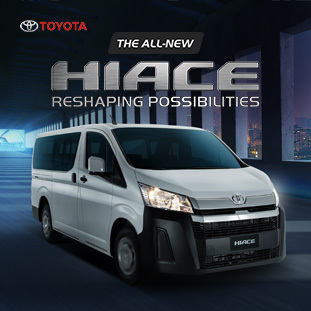 In the sea of vehicles on EDSA, the front fascia always stands out; the V-Motion grille displayed proudly. 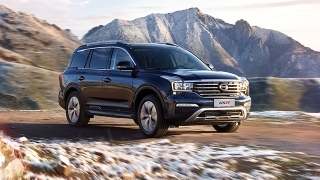 There are hints of Nissan Armada in the Terra, and the imposing look is definitely welcome, especially since it’s so refreshing to see a new face in the midsize SUV crowd. 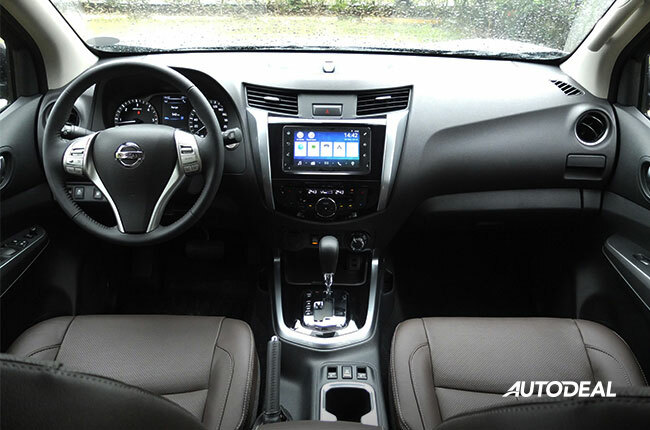 Broad shoulders and clean lines emphasize the size of the Terra. It isn’t bigger or taller than any of the competitors, per se, but it is one of the more simple yet effective designs from this segment. 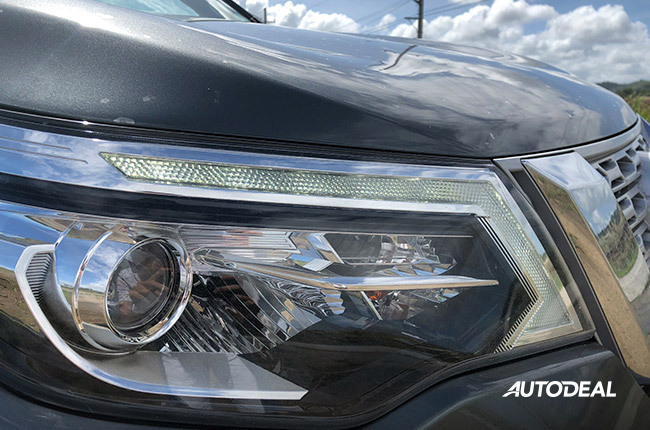 The headlights and running lights convey a macho yet premium feel, mostly in part to the HID projectors that are fantastic at night. The taillights are also neat, as the slim fishhook lighting signature is ala European. There’s also less chrome and more painted plastic, which suits my taste perfectly. 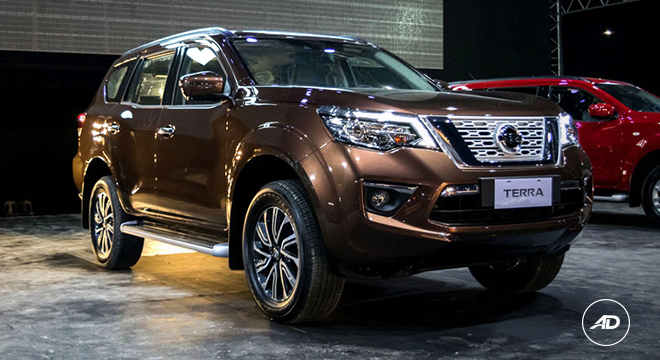 When put beside a Toyota Fortuner or Chevrolet Trailblazer, the Nissan Terra still looks the burliest of the three. In my eyes, the Nissan Terra is one of the better-looking midsize SUVs I’ve seen in quite a while. 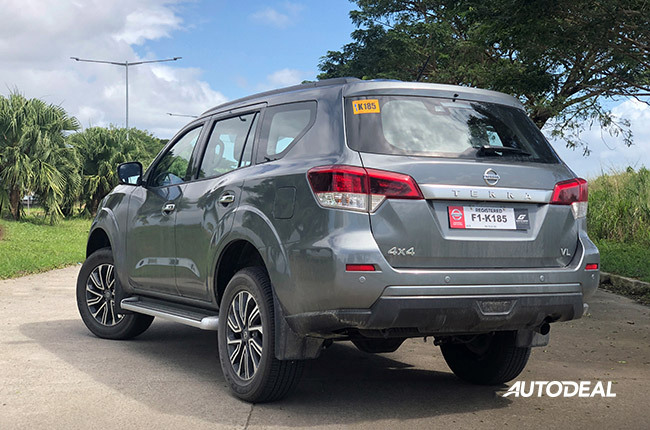 Having driven the Nissan Terra during its launch in Clark, Pampanga previously, we made mental note to keep closer tabs on the interior and build quality of the car once we finally got our hands on some review units. 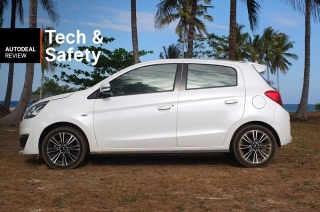 After all, driving on lahar fields and climbing over loose boulders and rocks has a tendency to divert our attention elsewhere. 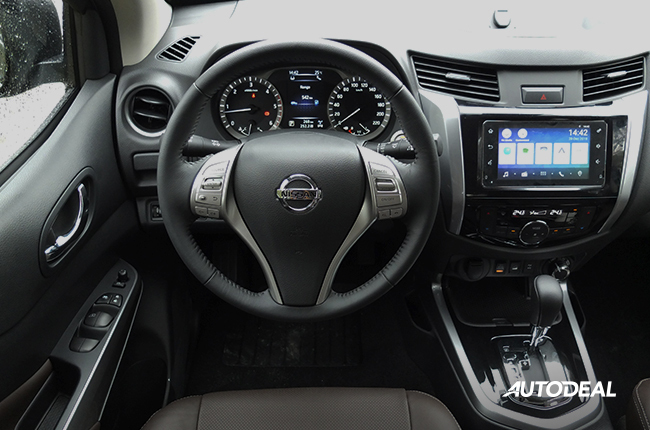 Once you step into the Nissan Terra, you’ll notice that this contender for the crown has one of the safest and most conventional dashboard designs around. Plastic is the primary material here, and while it is textured, it felt rather unimpressive. There are some touches of leather on the armrest, door panels, and steering wheel, but that’s about it. 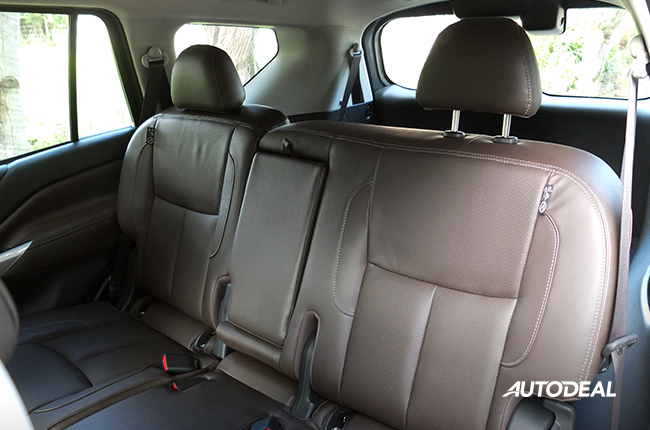 The seats are leather, so there are some bonus points for that. More soft touch plastics would’ve elevated this cabin further, and the buttons and switchgear, while all logical and intuitive, felt rather bland. Also, the steering wheel can be tilt-adjusted only, which is a bummer. On the plus side, everything works and feels as intended, it’s just that the whole execution felt slightly average. Third-row seating is reserved for children or small adults, but that’s par for the course. 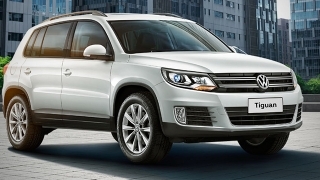 If you want a midsize SUV without a busy interior, this is the one to get. In an age where plastic wood and faux carbon fiber are found in almost every car, those looking for no drama can find something to love here. Right off the bat, I have to say that the Nissan Terra has some of the best air conditioning in the business. 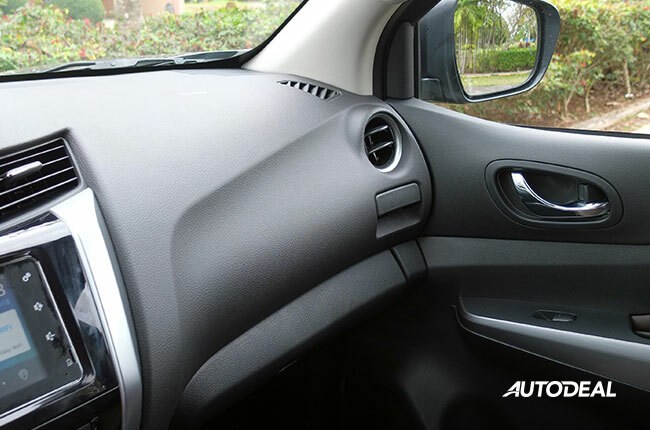 The automatic climate control works wonders, cooling the cabin quietly and efficiently. So much so, in fact, that those vents for the second and third rows become questionable on all but the hottest days. 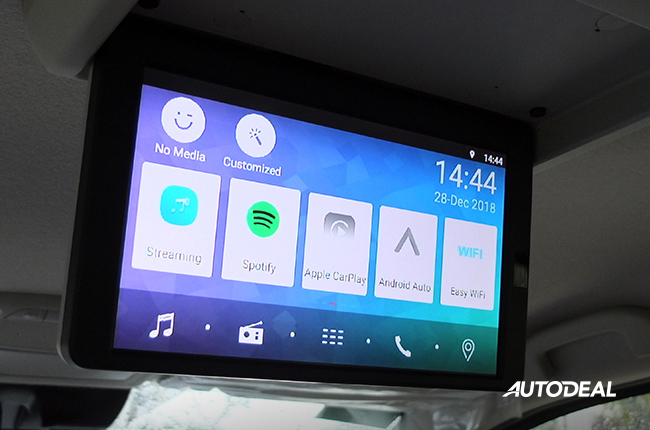 At the center of the Terra’s dashboard is a seven-inch infotainment screen that happens to be an Android unit. 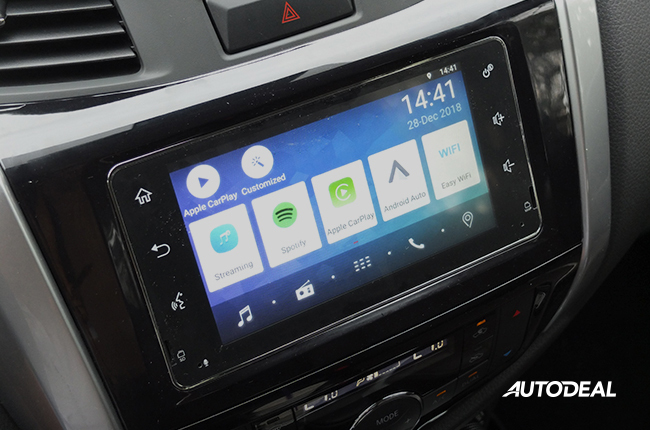 It’s simple enough to use and the response is good, plus it supports Android Auto and Apple CarPlay, which I used extensively during my time with it; the connection is quick and painless, and you’ll be streaming songs and navigating with Waze in no time. Located near the center cup holders are a set of nifty switches that allow you to fold the second row automatically for easy access to the third row. Pull them and the seats tumble forward effortlessly, you do have to manually put them down, however. 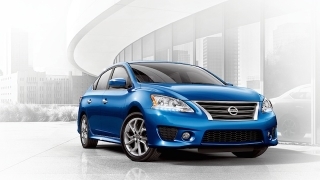 You also have automatic headlights, rear parking sensors, blind spot monitoring, and audible lane departure warning. 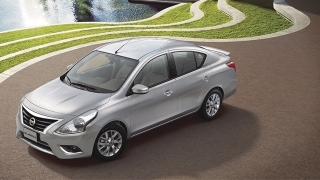 All the features I listed work seamlessly and without complaint, and are a welcome addition to any vehicle. But let’s talk about Nissan’s Intelligent Mobility suite on the range-topping Terra for a bit. Kudos to Nissan for integrating an around view monitor on the Terra to help out with tight parking situations and when you’re off-roading and you don’t want to be playing your clearance by ear. 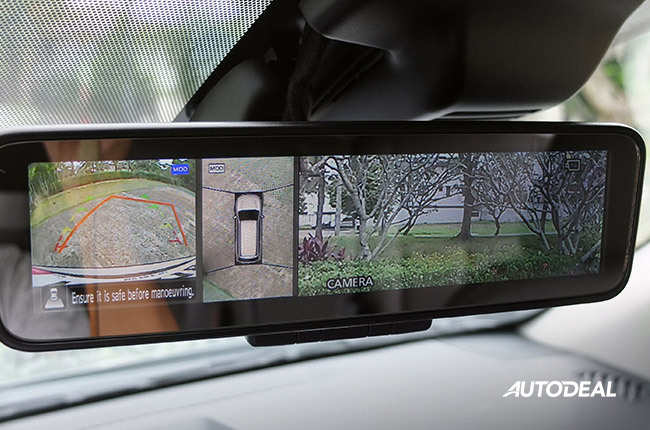 The digital rear-view mirror that projects a video feed from a rearward camera is also a neat idea, meaning you don’t have the heads of passengers, tall luggage, and seats blocking your view. Unfortunately, the whole package isn’t as seamless as you’d want it to be. 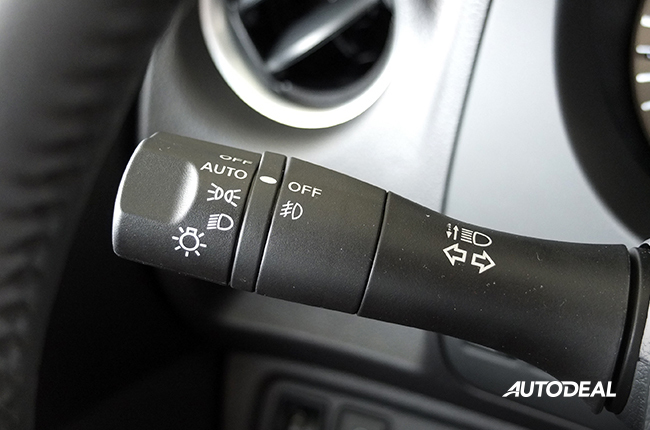 For example, slot the gear into reverse and you won’t get your reverse camera displayed on the rearview mirror until you flip the mirror dimmer. The same goes for all the other functions such as around view monitor and toggling of your camera views; you have the extra step of activating the mirror to digital mode to get any of these. Understandably, this is their first iteration of this technology and software in this segment, so it is workable and serviceable. Driving the Nissan Terra for a good few days made me realize just how fun a midsize SUV can be with the right components and, of course, sensible driving manners. 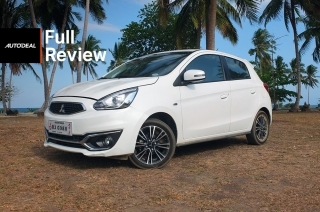 The punchy 2.5L turbo diesel mill is responsive and surprisingly smooth once you start cruising. There are 190 hp and 450 Nm of torque on tap, and the Terra is perfectly capable of surging forward and picking up speed quickly. 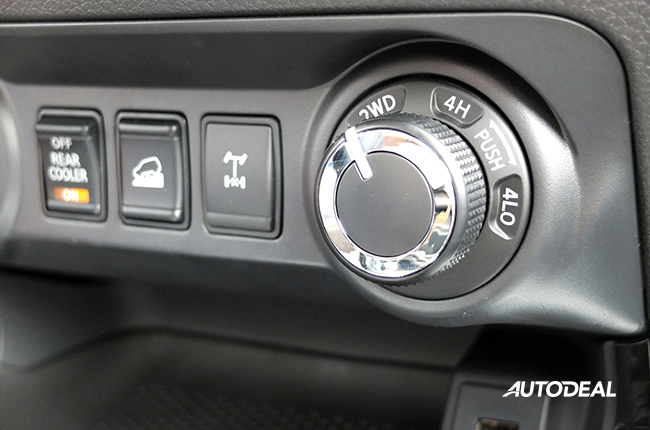 The seven-speed automatic transmission is almost imperceivable when driving, and helps save some fuel on longer drives. The steering feel can be a bit heavy when compared to its competitors, but that means that the Terra’s road feedback is pretty darn good. 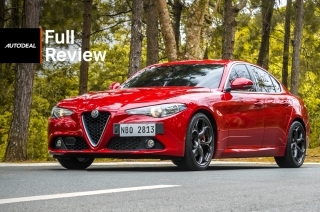 The ride is also worthy of praise, offering just the right amount of stiffness and give on road imperfections, and my passengers at the back found it to be very compliant. Definitely one of the better riding midsize SUVs on the market today. When taking turns, expect the usual body roll, and this is what is expected of this category. I did notice, however, that nose diving during braking was handled very well by the Terra. The same goes for hard acceleration; the diesel surge isn’t too perceivable in the cabin, aside from the usual engine noise. Fully loaded and with a destination in mind, the Nissan Terra fits the bill as a long distance cruiser, taking on paved sections and off-road trails with determination. 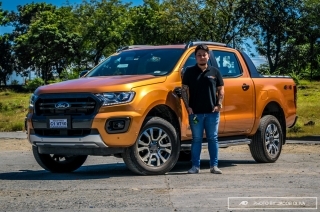 When the road really gets tricky, there’s an electronic four-wheel drive system with a dial to switch to from 2WD to 4WD, and it even comes with a limited-slip differential. Hill descent control is also included. 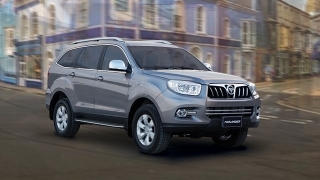 You can read more about our off-road experience with the Terra during its launch by clicking here. 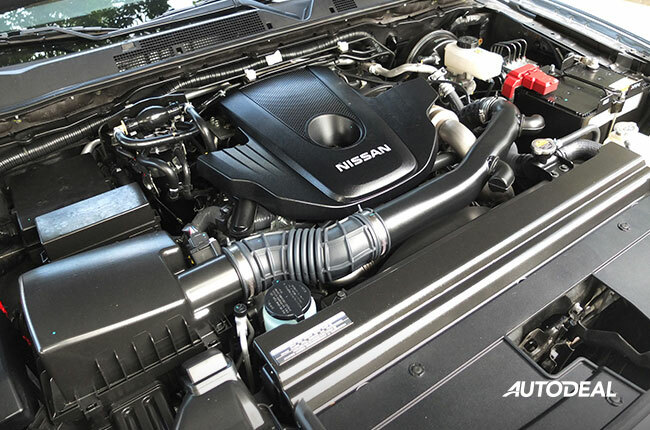 The top-of-the-line Nissan Terra comes equipped with a respectable six airbags, ABS with electronic brakeforce distribution, a tire pressure monitoring system, and stability control. 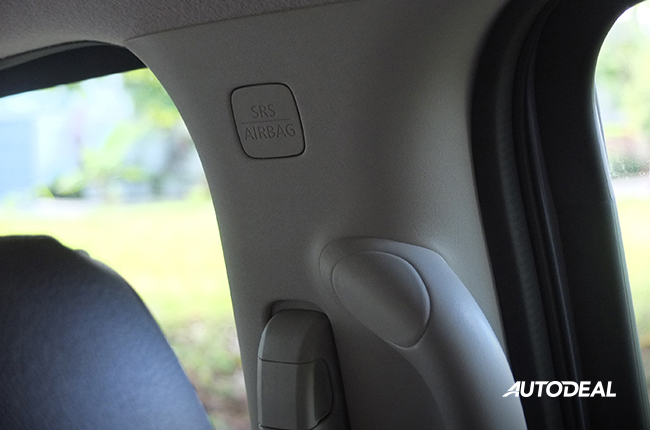 Active safety is courtesy of blind spot indicators, the smart camera system, and lane departure warning. 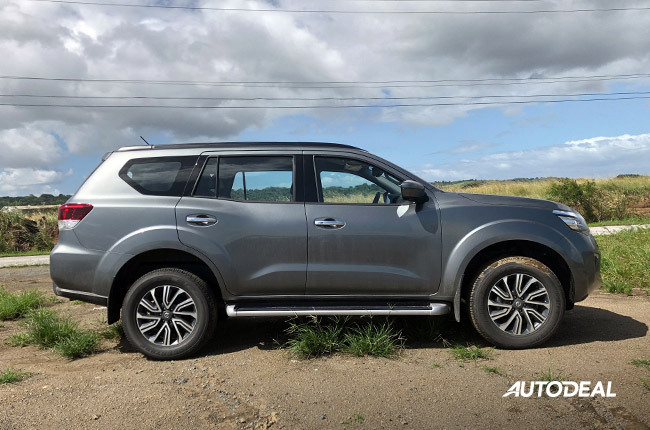 This makes the Nissan Terra a thoroughly kitted out vehicle in its segment, punching up there with the top trims from the other brands. 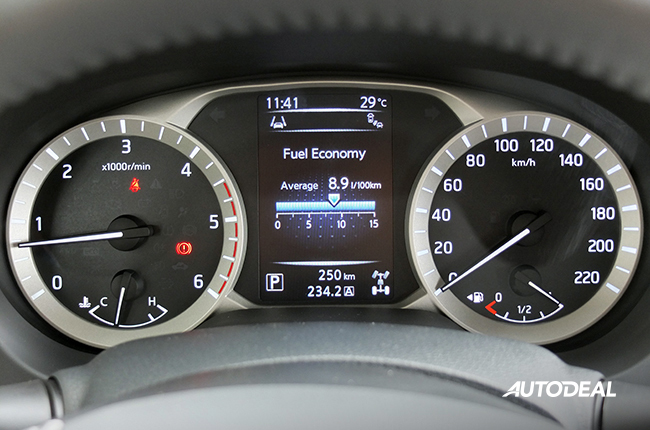 In the city, the Nissan Terra can achieve a respectable 6-7 km/L depending on traffic conditions. In my area, where it’s usually a mix of suburban roads and a few stoplights, the Terra returned a decent 9-10 km/L. On the highway, staying at the speed limit and without necessarily driving economically, I was able to get at least 14 km/L. 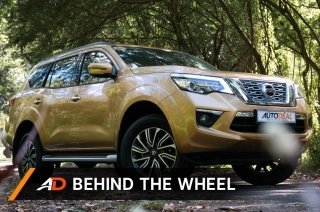 In my week with the Nissan Terra, I found myself impressed with its on-road manners and driving experience. By these merits, it’s a slight step above top contenders who have been in the game for much longer and contenders who have a much bigger chunk of the market. Unfortunately, I found myself underwhelmed and slightly frustrated with the Nissan Intelligent Mobility suite in the Terra. 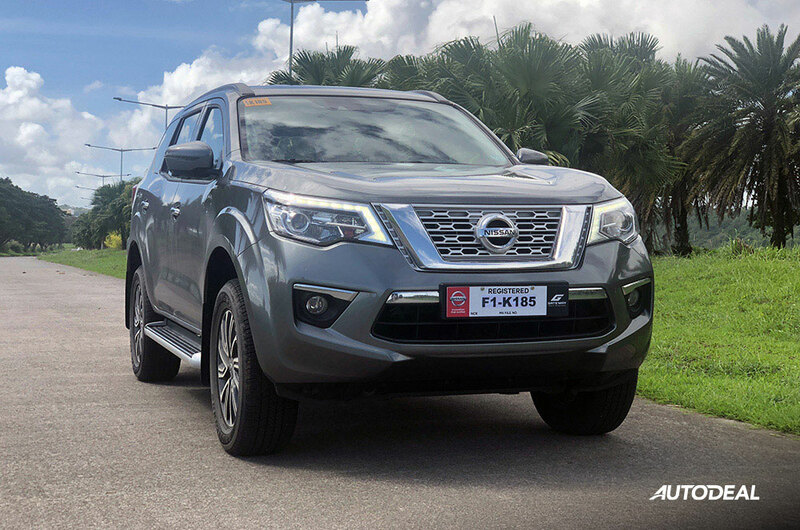 As far as midsize SUVs go, the Nissan Terra proudly flaunts its looks and capability but is slightly let down with questionable design and technological implementation. At the end of the day, for the price of this Nissan Terra 4x4 VL at P2,096,000, you’re undercutting some serious competition while offering a unique safety and technology feature set, handsome looks, and a good enough driving experience that could win over a few pessimists. Better late than never? 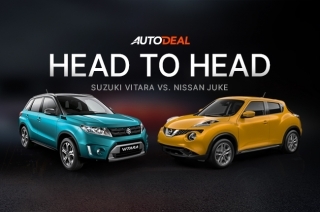 Definitely, and the Nissan Terra is a solid performer. If they can iron out the kinks by the next generation or in its facelift, we may just have a new winner soon.